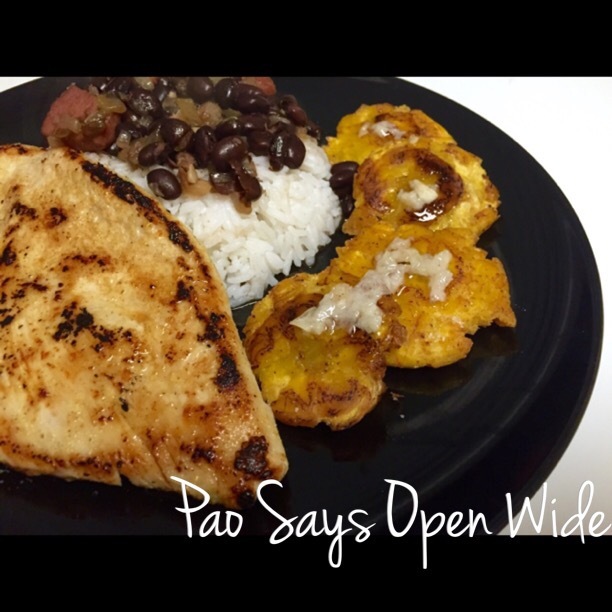 Back To My Roots: Rice and Black Beans, Chicken, and Tostones with Mojo – Pao Says, "Open Wide!" I grew up in a Dominican and Puerto Rican household. Between my mom’s amazing mojo sauce for tostones and my grandfather’s incredible talent for making all different kinds of (rice and) beans, it is safe to say I was always pretty well fed. Below is my recipe for black beans! Coat the bottom of a pot with about 2 tbsp olive oil. Toss in the smoked chops until they get a bit of color on them (sautéed for a few min). Next, add in and sweat the the onions, garlic, cubanelle pepper. Add a heavy splash (about 1/4 cup) of white wine. Drain the cans of black beans and then add them to the pot. Fill 2 cans worth of chicken stock and add them to the pot. Add the bay leaves, cumin, and cilantro. Bring to a boil and then reduce heat to a simmer for about 45 min or so, stirring occasionally.